Nicolas Copernicus  Heliocentrism. De revolutionibus Orbium coelestium, libri IV (Revolutions of the heavenly orbs). Nuremberg. Thanks to everyone who came along to the first in the series of book clubs on Mark Fisher’s Capitalist Realism. It was a real pleasure to meet so many people with diverse perspectives and common interests. We will continue with chapters 4 & 5 in May 2018. In April we’re discussing Structure, sign and play in the discourse of the human sciences, Jacques Derrida’s inaugural paper on deconstruction presented at Johns Hopkins University in 1966. If you would like to propose a text and facilitate the book club please visit the website for more info and to download the infosheet. Our first independent Critical Theory in Contemporary Art Practice course is fully booked but we’re organising another edition of the course on the basis of a labour exchange, giving those who cannot afford the fees the opportunity to participate. This will also be a great opportunity for those who are interested in working together to develop an alternative model of free and sustainable education. For more information, to join the team and get involved please visit the proposal page on Openki.net. 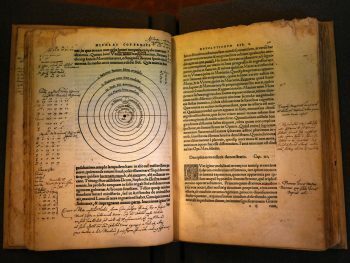 Nicolas Copernicus (1543) Heliocentrism. De revolutionibus Orbium coelestium, libri IV.